What is a robotic end-effector? A robotic end-effector is any object attached to the robot flange (wrist) that serves a function. This includes robotic grippers, robotic tool changers, robotic collision sensors, robotic rotary joints, robotic press tooling, compliance devices, robotic paint guns, robotic deburring tools, robotic arc welding guns, robotic transguns, etc. 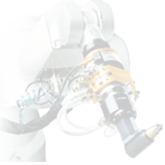 Robot end-effectors are also known as robotic peripherals, robotic accessories, robot tools, or robotic tools, end-of-arm tooling (EOA), or end-of-arm devices. Click here to view a short version of this video.